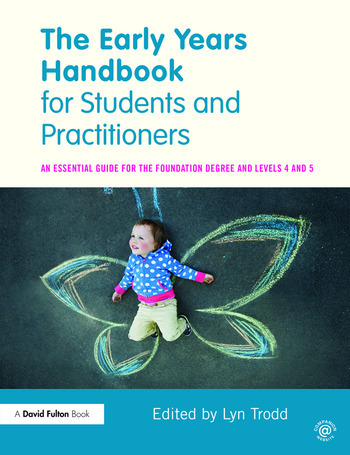 The Early Years Handbook for Students and Practitioners is a comprehensive and accessible course text for all students studying at levels 4 and 5, including on Foundation Degrees and Early Childhood Studies degrees. Designed and written by the Chair of the SEFDEY (Sector-Endorsed Foundation Degree in Early Years) Network and a team of expert contributors, this book covers the essential skills, knowledge and understanding you need to become an inspiring and effective early years practitioner. Divided into four parts: The Student-Practitioner-Professional; The Learning and Development of Children 0-5; The Child, Family and Society; and The Senior Practitioner-Professional, the book covers all aspects of working with young children and engages you with theory that is explicitly linked to your practice. Throughout there is a strong emphasis on supporting your transition to undergraduate study, developing your academic skills and encouraging you to be an active learner. ‘From Research to Practice’ boxes outlining key research in the field and implications for practice. The book is supported by a companion website featuring, for students, links to useful websites and video material, and an interactive flashcard glossary. Online support for lecturers includes ideas for tasks and activities to use in class and the diagrams and images in the book available to download. Lyn Trodd (editor) is Associate Dean, UK and International Collaboration in the School of Education at the University of Hertfordshire, UK. She is also Chair of the SEFDEY network.